If this was a preview of what a playoff series between the Penguins and Capitals would look like, it would certainly be one for the ages. After coming back to win a couple games recently when falling down 3-0, it was Pittsburgh's turn to watch another team erase their three goal advantage, but it was Kris Letang connecting with Sidney Crosby to spring the captain for the game winning goal in overtime that made the difference. Matt Cullen potted the first two goals, Conor Sheary had the other, and Matt Murray stopped 27 of 30 shots on goal to give Pittsburgh the 4-3 overtime victory. The Penguins won their 8th straight game and clinched 2nd place in the division after reaching overtime, and the Crosby goal put the exclamation point on the stunning turnaround under Mike Sullivan. In an important game, the Pens were able to come out of the gate and get the early 1-0 lead. After the refs missed a blatant T.J. Oshie high stick on Patric Hornqvist, Matt Cullen did the team one better than a power play when he beat Braden Holtby to open the scoring 44 seconds into the game. 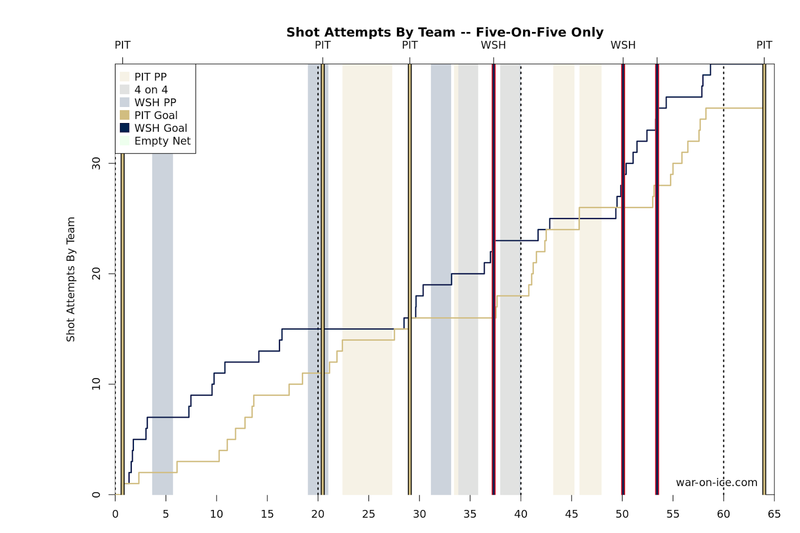 The Capitals would have an opportunity to pull even a few minutes later when Ian Cole took a delay of game penalty when he cleared the puck over the glass from the defensive zone, but the Penguins' penalty kill would do a great job forcing the action down into the Washington zone and prevented the Capitals from getting on the board. Pittsburgh would do a good job getting numbers in transition throughout the period, but Holtby would manage to keep the Capitals in the game. Carl Hagelin and Phil Kessel nearly connected for a goal, but Kessel couldn't corral the bouncing feed and didn't register a shot on net. Hornqvist would feed Sidney Crosby on a cross ice pass shortly after, but he wasn't able to beat Holtby on the one timer. Evgeny Kuznetsov would force a Kris Letang turnover deep in the Pittsburgh zone, and Letang would end up taking a slashing penalty after Kuznetsov drove the Penguins' net to put the Capitals back on the power play in the final minute of the 1st period. The teams would enter the first intermission with the Pens leading 1-0, and while the Capitals would have time remaining on their man advantage to start the 2nd period it would be Pittsburgh getting the early goal shorthanded. It would be Matt Cullen getting the goal again, this time 28 seconds into the period, when he backhanded a pass intended for Eric Fehr off Matt Niskanen's skate and behind Holtby to make it 2-0 Pittsburgh. Shortly after the goal, Tom Wilson would take a run at Nick Bonino, sending him face first into the boards. It was egregious enough to draw a 5 minute boarding major, and it gave the Penguins an extended power play to try running up the score. While they were lucky enough that Bonino was able to join them for the man advantage, the power play didn't appear to be on the same page, and Washington was able to escape unscathed. It was a short reprieve though, as Pittsburgh would light the lamp for a third time midway through the 2nd period on a rush down the ice. Tom Sestito would draw a defender inside the blue line and dished the puck off to Oskar Sundqvist, who passed the puck over to Conor Sheary who one timed the puck past Holtby. The Pens would put the league's 3rd best power play on the ice again moments later when Ian Cole was called for holding Kuznetsov's stick. While the Capitals were getting closer to beating Murray and getting on the board, they weren't able to break the ice, and almost immediately after Cole left the box he was tripped by Justin Williams in front of the Pittsburgh net. But it would be a short lived power play for the Penguins, as they turned over the puck at the top of the zone early in the opportunity and Trevor Daley took a holding penalty trying to prevent Daniel Winnik from getting a breakaway. The Caps would finally get on the board shortly before the second intermission. John Carlson would direct a shot pass to Marcus Johansson on the far post, and while Johansson whiffed on the one timer the puck deflected off his skate and into the Pittsburgh net. A pair of penalties would leave the teams playing 4-on-4 for the remainder of the 2nd period. Kris Letang cross checked Alexander Ovechkin in front of the net, and Ovechkin received a minor penalty for diving, mostly because there isn't a major penalty on the books. It was an absolutely pitiful and disgraceful attempt to buy a call, and the refs rightly sent him off. With a 3-1 score to start the 3rd period, the next goal was going to be huge, and the Penguins came out like they really wanted to be the ones to put it up on the board. The controlled the play in the early minutes, and they'd go on the power play early in the period when Winnik was called for high sticking Oskar Sundqvist. They wouldn't score on the man advantage, but they'd get another when Niskanen took a cross checking penalty against Sheary after Pittsburgh had a great shift pinning the Capitals into their own zone right after the penalty to Winnik expired. 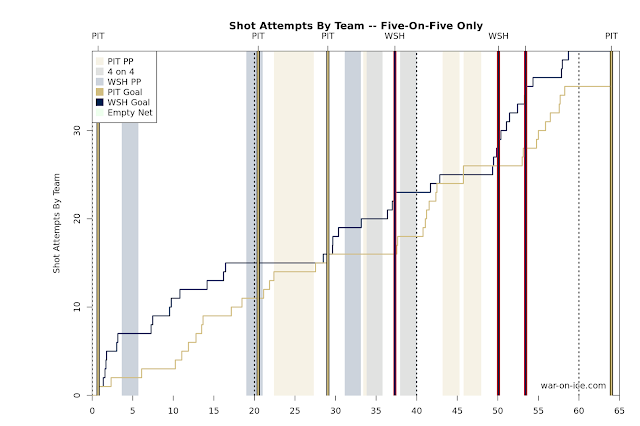 The Pens would have some good chances to regain the three goal lead, but Holtby was able to shut the door. Washington would kill off that opportunity as well, and it allowed them to make it a game midway through the period when Johnansson got his second of the game when he beat Murray from the left circle on the short post. The goal gave the Capitals some real momentum for the first time in the game, and they began to crank up the pressure on the Penguins and kept them in their own zone. It would eventually pay off for them, as after Pittsburgh failed to clear the puck Carlson passed it to Andre Burakovsky on the crease, and Burakovsky was able to deflect it over Murray to tie the game 3-3. The Pens would be in a dogfight to make it to overtime as the Caps continued to pour it on trying to get the go ahead goal, bu the teams ended regulation with the score still tied. After an open, back and forth start to the overtime period, Letang threaded a pass from the Pittsburgh zone to Crosby at the Washington blue line to spring him for a breakaway, and Crosby backhanded the puck past Holtby to give Pittsburgh the 4-3 win. It wasn't one of the best games the Pens have played lately, but it's still a win against the Presidents' Trophy winners in their own building, and Pittsburgh did come out ahead with a score-adjusted 52.6 CF%. The Penguins will close out their season Saturday against the Philadelphia Flyers in a game where they could potentially eliminate their in-state rivals from the postseason.